Yesterday was leg one of our fast-paced, multi-day road trip through the Pacific Northwest. It started out as a non-stop drive through Northern California straight to the rocky coastline of Oregon…but eventually Katy got tired and let me drive for awhile. Apparently, unbeknownst to her, my predilections towards being distracted by shiny objects directly translates to several small, unplanned pit stops. While driving through the mountains north of Redding, CA a sign caught my eye. Unfortunately, the next right was only 50 feet from the sign so it woke Katy up when I slammed on the brakes and swerved to see what a mountain top winery looks like. Do the grapes grow right up the side of pine trees? What role do the pinecones play? Do they hire yetis for the annual grape crushing? These are the questions we would never know the answers to if we didn’t stop! She seemed to leave it at that but she was clearly trying to decide if letting me drive was the right move, tired or not. It didn’t help my cause that, despite the beautiful surroundings, when we pulled up to the One Maple Winery we were met by a fairly cold reception from the owner, Ernie. 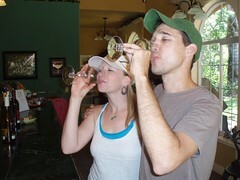 However, by the time we had gotten to the question about the grape crushing he had warmed up quite a bit. After twenty minutes of friendly banter from Ernie (and a purchased bottle of Chardonnay later) Katy was willing to cede that it was worth stopping for after all. 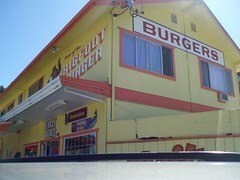 Back on the road it was AT LEAST half an hour before we passed Bigfoot Burger and I murmured, “Shoot! I wish I had’ve gotten a picture of that.” It was a couple more seconds of careful consideration that I hit the brakes again and pulled off to the side of the road. We did end up stopping. At least for the time being I seem to have lost my privileges. I was scared it meant no more weird things, so I just took a nap…but then I woke up to THIS. Katy’s a good road trip partner. Yay! Paul and Blue! I've been there too, right outside of Crescent City. Fun trivia fact: there is a pull off in the road headed towards Crescent City from the redwoods that provides a specific view of the coast line that is the opening shot of E.T. 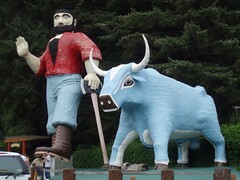 The fudge at that Paul Bunyan road side stop is amazing. My mom, would make us drive up there from L.A. 2-3 times a year to 1. get fudge and 2. visit family.